If the idea of drifting leisurely over the Atlantic on a 37-hour journey between New York and London with access to a luxury sleeping cabin and a bar with the best view on (or, technically, above) Earth appeals to you, you’ll like this: The hydrogen airship has been re-imagined as an eco-vehicle. 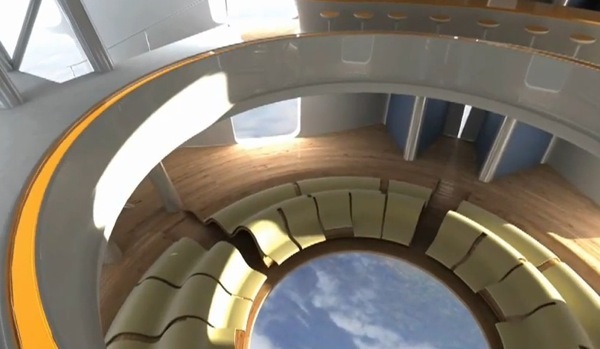 This is a dreamy concept from designers Seymourpowell that’s intended to whisk 100 passengers across the Atlantic with a whiff of the same sort of luxury that those Zeppelin-fliers used to experience way back in the last Century. 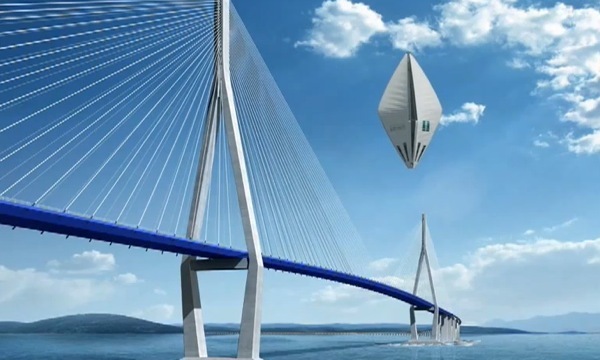 Except that the Aircruise is actually a 21st Century vehicle, semi-rigid and filled with hydrogen, with some boost from solar heating to lift it to its maximum 12,000 foot ceiling. It’s also powered by Large Polymer Electrolyte Membrane hydrogen-power fuel cells for in-flight electricity and drinking water. And unlike those precarious aluminum and canvas Zeppelins of the 1930’s, Aircruise is made of modern materials that included self-healing floatation chambers–meaning there won’t be any recurrences of the event that famous destroyed the Hindenburg. Add in glass viewing floors (not advisable for those who’ve been at the bar for too long) luxury cabin suites and a staff of 14 and what you’ve got is half cruise-liner, half aircraft, and half something that’s at completely the opposite end of the environmentally friendly spectrum to the Airbus A300 superjumbo. That aircraft has been compared to a luxury cruise ship, too, but while it achieves environmental economies of scale thanks to its enormous size, it simply cannot compete with Aircruise. Will we be seeing these things drifting through the sky any time soon? Probably not. But earlier Seymourpowell concepts were attractive enough that this Aircruise concept was actually commissioned by Samsung. Samsung’s goal is to search for solutions that could be in production in 2015, but before Aircruise or similar vehicles become popular, we’ll have to re-direct how we think about flying long distances. Because Aircruise can of course get you across the Pacific in comfort, versus the cramped awkwardness of sitting in a Jumbo, but instead of roughly half a day, you’ll have to allow for four days of travel. At least the jetlag wouldn’t be as bad.